Global knives are razor sharp and exceptionally light. Knives from global are unique in the world of fine cutlery. High Tech from tip to handle. The two most innovative features of global knives are their edge and the way they are balanced. The most important feature of any knife is its edge, and the global edge is truly its signature. 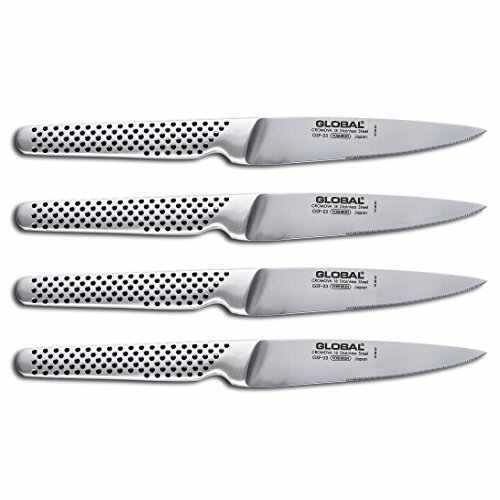 The global 4 piece steak knife set is easy to control and a joy to use because of it's lightness, flexibility and sharpness. Set includes: -4 steak knives. Features: -lightweight, precisely balanced; the handle is hollow and filled with just the right amount of Sand to create the perfect balance. -Edge retains razor sharpness exceptionally well; they are ground straight to a point rather than beveled resulting in a dramatically sharper knife which stays sharper longer. -Seamless construction for easy cleaning. Specifications: -material of knife: blade made of high-tech molybdenum/vanadium stainless steel. -Material of handle: stainless-steel handle molded for Comfort, dimpled for safe grip. -Lifetime limited warranty against defects and breakage. Cleaning information! sharpening information! user guide! more information on global knives: the two most innovative features of global knives are their edge and the way they are balanced. The most important feature of any knife is its edge, and the global edge is truly its signature. The majority of the global knives are sharpened or ground on both sides of the blade like western style knives. However, their edges are ground straight to a point rather than beveled resulting in a dramatically sharper knife which stays sharper longer. The edge is so large and prominent that it is easily seen with the naked eye and extends a quarter inch or more up from the tip of the knife. To balance their knives, global uses a hollow handle which is then filled with just the right amount of Sand to create the correct balance. Global uses this method rather than using a full tang and a bolster to baby. If you have any questions about this product by Global Cutlery, contact us by completing and submitting the form below. If you are looking for a specif part number, please include it with your message.